HOW TO ADD ANNOTATION FEATURES TO VIDEO? Annotation is an easy to use application that allows you to code events in terms of their type, onset, and duration. Annotation can not only be used to generate organized audio or video clips but also to extract complex event structures and then analyze them using your favorite statistics software. In addition, Annotation’s interface helps you spot patterns by graphically visualizing your data. Annotation is very flexible: it was built for labs at major research institutions but is already also being used by students, focus groups, human and animal behavior labs, a variety of training environments ranging from nursing to sports coaching, as well as several smaller niches. A document annotation is an annotation associated with a document or a file that is not personal means that everyone can read it, make additions or modify it. The changes that have been made in the document then are visible to every user who will retrieve it afterward. Image annotations include the changes being made in the images by editing them in different softwares that are nowadays available in the market. Image annotation includes improvement in the quality of the image; add some funny textures to it or combining two images together. The main concern of us in this project is to work on the video annotations. The video annotation feature is a newly developed technique that helps us to add details in our video by making changes in the video clip. We can add notes to a clip, an image, some text, headings or combine two separate videos together to make them appear as they are the part of a single video, which will be visible to us during the playing video. To annotate a video one must have a video annotation tool. The Video Annotation Tool lets you add notes to time segments on a video timeline. You can view the video clip, mark a time segment, play back the segment, or attach your written notes to the segment. Video annotation tool is a special type of software that allows user to graphically interact with software and make changes in the videos. Youtube is an online video viewing website that allows users from all over the world to view and share different types of videos lying under different categories. It includes videos lying under the categories like Science and technology, Learning, Music etc. In fact all the types of videos can be viewed as well as downloaded from the Youtube website. Unregistered users can only view and download the videos available on the website while the registered users can also upload their own created video on the website that would be displayed to all the users who will access the site. Notes feature of annotation allows us to add text in a playing video. The added text will appear on the video at that particular time where the user would like the text to appear. This adds details to the video clip. As an example the text has been added to the clip that is visible at the bottom of the playing video. Speech Bubble feature of the youtube let us allow to add a speech title in the playing video we can add the comments to the playing video. The comment can be of any type it can be to explain the video or either to create humor in the video. The addition of a speech bubble to the video helps in adding detail to the video it also helps in creating interest in the video. The example of speech bubble added to a video is shown below. Spot-light annotation is a type of annotation that is being added in the video to highlight a particular point. It is to mention the importance of that point or that image clearly in the video so that the viewer will focus only that point of the screen. Pause annotation is a type of annotation feature that helps to pause the video for a certain period of time and that part of the video clip is then visible to the viewer in the pause state i.e. the video will not move and will be stopped at that particular moment. Open your account and then click on my videos in the account tab. This will open all the videos that you have uploaded in your account. Select the video to which you want to add annotations and on the bottom there will be the Annotation tab. When you click on the annotation tab the annotation a window will appear in which user will see all the annotation features being provided by the Youtube. Now how to add these different kinds of annotations? Pause the video at he moment on which you want to add the note and then in the annotation dialog box click on the add note annotation tab. The note text box will appear on the video screen then you can add the text there. Pause the video at a particular moment and then click on the add speech bubble annotation tab in the annotation dialogue box. Then select the accurate position of the speech bubble and control it with the time line. To add spotlight at a particular instant click on the add spotlight annotation tab in the annotation dialogue box and adjust its position on the screen to highlight the particular area of the screen. To add the pause annotation to pause the video for some time during the playback click on the add pause annotation tab in the annotation dialogue box. Change the annotation’s text by simply clicking on it and entering the desired text. Resize an annotation by adjusting the resize handles (small white circles that appear when you move the mouse over the annotation). Change the speech bubble’s pointer location by dragging the resize handle that appears when you move the mouse over the annotation. Change the location of a spotlight’s text by dragging it to the desired location. You can change the start time and end time of your annotation. An annotation's default start time is when you click to add it ('+' icon). The default end time is 5 seconds later. To change this, just enter the start and finish times you want in [H:MM:SS.s] format. For instance, [0:01:05.2] means 1 minute, 5.2 seconds into the video. You can add a URL link to your annotation. Many types of links can be added including links to Youtube videos, Channel pages and much more. To find out about the types of links available go to 'Linking Annotations'. You can delete annotations from the list on the left. Click the [x] on the upper right corner of the annotation you want to delete. You can change the duration of a Movie Pause Annotation by changing the right time field of the pause annotation. You can switch between annotation types. Click on the arrow next to the annotation’s symbol (top left corner of the annotations cell in the annotations list) and select the annotation you would like to switch to. The system will automatically save your work in draft mode every 30 seconds. If you want to save your work more often, click on the 'Save Draft' button at the top left of the annotations panel. Users won't see your annotations until you publish them using the 'Publish' button found at the top left of the annotations panel. The system will not automatically publish your annotations. When you will publish your video on the video screen a tag will appear that will show the tag Preview your video here when you click this tag a window will appear that will be showing the annotated video. On the right side of the video there will be a tab showing Audio swap, by clicking on the tab a new page will appear that will be showing different songs that you can add with your video. Then to preview your video with that song you have to click on preview video tab on the right side of the page, this will display your annotated video with the song running on the background. The annotation feature of youtube is very helpful in communication. Annotations might be an exciting way of establishing a better contact with the viewer. Adding the missing background information, making witty comments, or even adding some subtitles to your movies, make the whole process more appealing for the viewer. So, it can be used to give presentations on your products, hence it will create a good impression on the customers and increase the market value of your product. 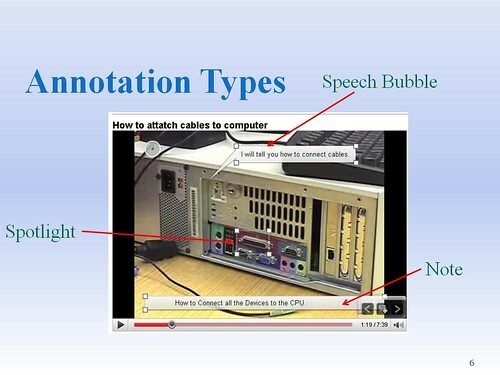 This feature of annotation can be used to teach the physically handicapped people e.g., if a person is deaf and cannot understand the video than by adding annotations to the video the video can be explained to him. This will help him a lot in learning. This feature of the youtube annotation helps instructors in teaching. It could help them in delivering their lectures to the students and making them understand the theme of the lecture. When there is no sound option then the Notes and speech bubble feature can be used to explain the main features of the lecture. This feature can also help us in making learning easier as it would be an entertainment as well as study. It is the psychology of human mind that it always learns in a user-friendly environment and youtube gives us the same feature. Following are some of the main objectives that make the video annotation feature of youtube so helpful and important in the modern era of learning and technology. To gather people on a single site (Youtube) and make people share their knowledge. To make the life easy i.e. to create easy and quick ways of learning. To make the main idea of the video clear to the viewer. To host different study and learning videos on a single source so that every one can easily acess it. • As according to the famous quotation “Those who tell stories rule society” (Plato), the main important fact of this annotation feature is to promote the sense of sharing knowledge among the people. This allows people to share knowledge and also to present his views to the whole world. Hence more people that don’t have much resource will be able to gain knowledge. • The annotation feature also helps to make things easier. In the sense that when we add details to the video than it becomes easier for a viewer to understand the key points of the video. • As discovered by the modern science that a person learns those things better in which his greater number of senses are being used. Similarly when a person is viewing video than he will be watching the video, reading the explanations being added to it and also will be listening. In this way he will be able to understand the main idea or theme of the video.